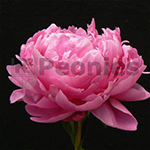 Gilbert Barthelot is one of the oldest varieties in commerce cultivated double pink Peonies. It’s still used a lot in cut flower business. With the nice fragrance is Gilbert Barthelot blooming in the middle season. With the lots of flowers up to 15 cm and the dark foliage, Gilbert Barthelot has an excellent use for landscaping in gardens and city parks. Every year older the plant gives more and more flowers.